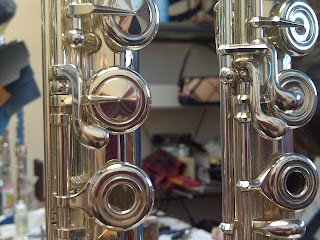 Repair My Flute: Changing a Mechanism? Last week's post on mechanism wear prompted another common question about mechanisms. Many people ask if their mechanisms can be changed. For instance, they may have a silver mechanism and are wondering if they can change their mechanism to one that is gold. The answer is technically yes, but the recommendation is quite the opposite. We sat down to chat with Repair Technician, Rachel Baker, to find out more. Rachel helped shed some light on the situation. She said that in order for a mechanism to be changed, you would have to completely retrofit a new mechanism to an existing flute body. This can be extremely time consuming, complicated, and expensive. Why is this? Well, flute mechanism designs change, and flute bodies may as well. Say you have an older Powell with a Traditional Powell scale -- or even a Powell with the Cooper scale. 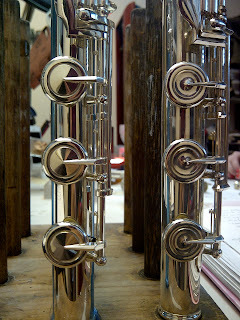 The Modern Powell scale is currently used, and a new mechanism would be fitted to the current flute bodies (built with the Modern Powell Scale). The positioning of the tone holes on the body is what determines the scale, so the positioning of the tone holes on a Powell with the Traditional or Cooper scales would be different that the current positioning. This would mean that a new mechanism would need many modifications to fit the existing flute. Very different mechanisms on 2100 and Conservatory. In addition to the tone hole positioning, there may be other differences in the design and location of keys, posts, and ribs, which would also mean that the new mechanism would need to be modified to fit. This can be a tremendous endeavor, which Rachel tells us is really not very cost effective. She estimates that the cost for changing the mechanism is often more than half the cost of the flute, so you are better off purchasing a new flute. Also, if you have a pinned or pinless mechanism, you cannot switch "back and forth." So, if you have a pinned mechanism and want a pinless mechanism, it would not be possible to retrofit a pinless to a pinned body. You can only go pinless to pinless or pinned to pinned. But, again, probably best to look into a new flute altogether. Finally, the question of changing a mechanism is probably related to a common misconception of flutes. You may have heard other flutists say, "Yeah, I bought a silver flute with a silver mechanism, but I will upgrade to a gold mechanism later." Well, that just may not be possible. You can certainly upgrade to a different model, but swapping out the mechanism is not a guaranteed option! Our best advice from the repair shop is that if you would like a new mechanism, you should pick a new flute that has it! Another view of 2100 (left) and Conservatory (right) mechanisms.